BetterTouchTool is one of my favorite Mac utilities. A real sleeper: originally it just let you create new trackpad gestures (or remap existing ones), and that was useful enough on its own, but it’s been beefed up with more and more interesting features. One feature I just discovered is that it can display a floating window with any HTML you want. This is a perfect way to show my Big Number Cheat Sheet, which is handy for checking your work when dealing with, well, big Japanese numbers. 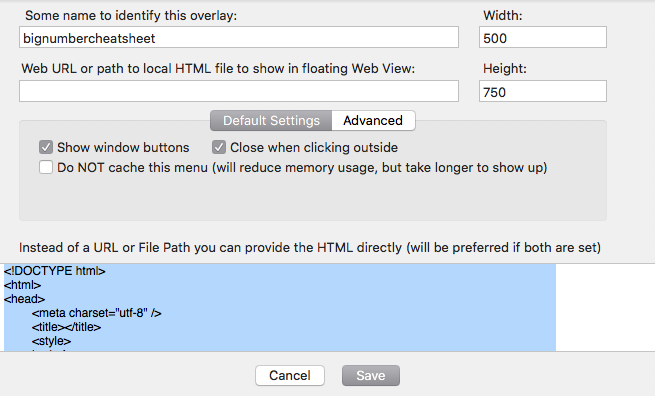 To use this, open up BTT, add a new triggering event (can be triggered by a key command or text string, trackpad, whatever), and add the action Utility Actions > Show Floating Web View/HTML menu. Give it a name, set it to a width of 500, height of 750, and paste the following in directly. (Posting this online introduces a space between the opening < and !DOCTYPE — that should be deleted.) Be sure to enable “show window buttons” and/or “close when clicking outside” or the window won’t go away. The Wikipedia article is also interesting in that it explains why there are seven colors in ROYGBIV in the first place, when our modern color models are based on three primary colors (RGB or CMY) with secondaries and tertiaries in between: it was an arbitrary decision to force the colors to correspond with the seven notes of the Western musical scale. Paging Rich Hall: In this modern era, when people communicate by blog, IM, twitter, e-mail, phone, and occasionally in person, we sometimes respond to things that our interlocutor said in a different medium—sometimes when it’s not obvious we were even a party to the referenced statement, which can be momentarily disorienting for the person who made that statement. We need a word for this practice of abruptly picking up a conversation in a different medium. Electrolocute? Ricosay? Resumversation? Paul Graham always writes interesting articles (though I can’t figure out for the life of me why he hosts them as a Yahoo store), but I don’t track him very closely, so when I ran across a link to his somewhat old Writing, Briefly, I read it eagerly. And noticed with interest that it has been translated into a number of languages, including a Japanese version (which I can read), and a Spanish version (which I can kinda fake). His advice “use simple, germanic words” may be good (though I’d phrase it as “Anglo-Saxon words”), and as a translation issue, it certainly stands out. The case with Spanish is knotty in its own way. I know Spanish has its share of loanwords, but it doesn’t have the overwhelming influence of French and Latin that English has (and even if it did, it would be harder to tell them apart), or of Chinese that Japanese has. So the call to use native vocabulary is redundant. The way the translator chose to deal with it here is interesting—it transparently acknowledges that the text is a translation, and that in this case, the idea doesn’t quite fit in the translation. Alan Siegrist, a scholar and a gentleman, has cracked the bad kanji tattoo code. Who knew it could all be boiled down to 26 characters? Language Hat posted links to some translations of Jabberwocky, which has been a pet interest of mine ever since I saw the French and German translations in GEB. Someone, years ago, sent me a bunch of Japanese translations of Jabberwocky, and they’ve been languishing on my hard drive ever since. Now seems like a good time to get them out there. I am posting these with minimal formatting because I’m lazy. Headings are translator names. Notes and credits are as I received them. See after the jump.